Our humble beginnings go back to 1940 and several men which included Harry a. Schutt, Clinton J. Phare, William Cox, Ralph Drews and Dan O'Connell. They, along with other interested persons, decided a yacht club was needed at the eastern end of greater Cleveland. The idea was to moor by Euclid Park at the end of E. 222 Street. They solicited interested persons through penny postcards mailed to owners of small craft registered with the Coast Guard. The response was greater than anticipated. Clarence Baldwin received three different cards and decided to attend a meeting to "find out what was going on". Discussion focused on being unable to protect boats on the open lake in Euclid; therefore, they needed another location. About this time the Harkness Estate, westward from the natural mouth of the Chagrin River, became available. 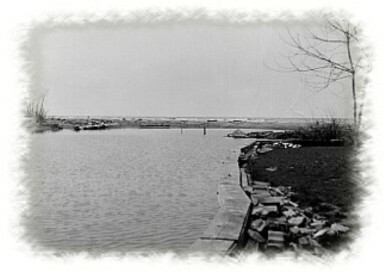 The estate was comprised of a number of buildings, many on a hilltop overlooking a lagoon once used for boat anchorage. Young men of the 1930's recall rowing their canoes down river to traverse the hill to visit a girls' camp located there. University hospitals of Cleveland was the underlying owner, and Clinton Phare was chosen to negotiate an option to purchase the property. "The cruisers were pulled out of the water on a temporary marine railroad. They got the boats on water and, if you were lucky, you had hip boots on or fishing waders to stay dry...only we never did. There was no platform on the car or anything. You had to go down that river and line the boat up on the cradle and then we hooked onto it with the cat tractor that we had. We pulled it out of the water and then uncoupled that cat tractor and went around the corner and pulled it down the batter boards. Down at the end of the batter boards the women had a big kettle of chili there, and between them and the booze, they tried to keep us alive until we got them all out." 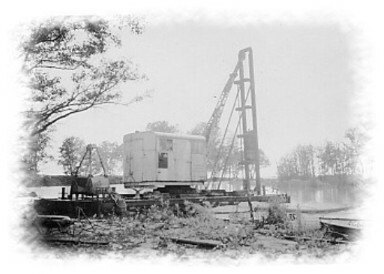 In 1950 our first travel lift was purchased to simplify this process, and the present channel for the lift was dug. A new travel lift was bought in 1972 and has been refurbished as needed. "We put our crane on the barge and when we got an applicant for membership in the club...we'd dig enough water lilies out of that outlet to make two docks and one catwalk...we also had an eight inch sand sucker but we didn't get much use out of that because it wouldn't stand still and we'd spend three quarters of our time cleaning the slug of sand out of the pump and about one quarter of the time trying to dig sand." When a new member joined, a spot was dug for his boat. He put in his own wooden dock and the next new member went on the other side of him. Essentially, our lagoon was dug as our membership grew. Over a period of years, the dredgings were piled in the area which would eventually become the Spit. 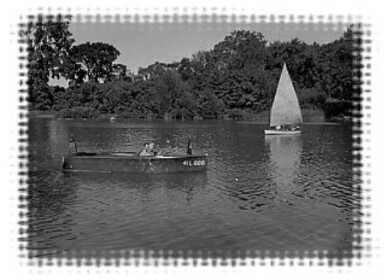 In 1953 the islands were removed from this area and our sail lagoon was dredged. It was 1972 before the spit evolved to its present state. The gas docks have always been in the same location, although floods at various times have caused renovation. As early as 1969 we sold diesel fuel. As lake levels of Erie rose, erosion increased on our frontage and river wall. The CEI intake and subsequent altering of currents has necessitated pilings and bulkhead placement along our outer borders. Many man hours and dollars have been invested preserving our little corner of the world. 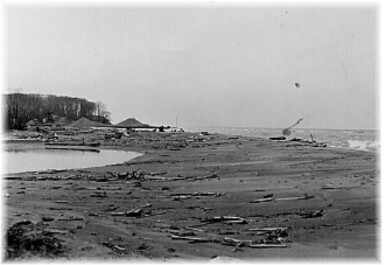 In the early 1980's, four clubs and a marina in the Chagrin River Association, in cooperation with the city of Eastlake and the Army Corps of Engineers, paid for improvements on the river mouth which exist today. The saw-tooth along the river wall was completed in 1985 to lessen a tremendous surge problem in the lagoon. Much of this work was done by contributions of members' man hours and back power. 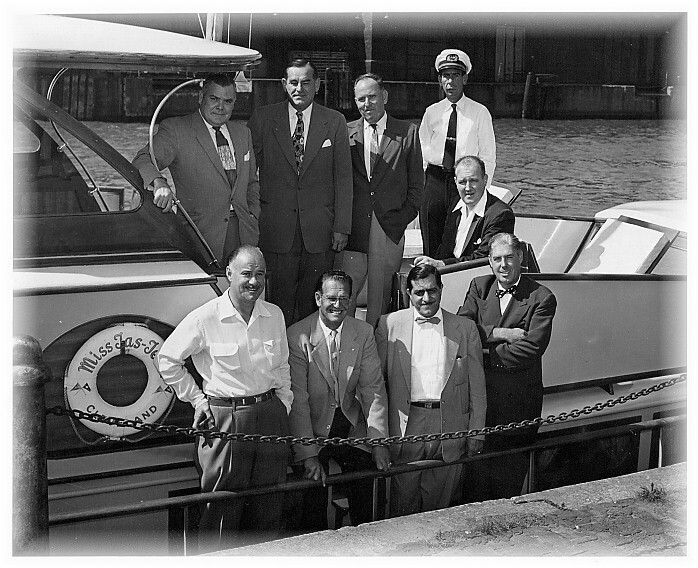 Because boating is a social as well as a recreational pastime, our founders realized the need for "gathering areas". Clubhouse construction began shortly after the club was established. Scrap beams and joists and membership labor were used. Dan O'Connel, Sr. Is credited with this project. Our main forum has been renovated and redecorated several times. In 1960 the roof and furnace were replaced. Other significant additions were the gas fireplace in 1965 and movement of the bar, the addition of the Baldwin Room in 1979 and the upstairs renovation of the entrance hallway and restrooms. Records show that over the years refurbishing, mostly through members' contributions, has kept our clubhouse stylish and serviceable. Other structures have been erected on our grounds to facilitate us in work and play. The cottage and garage have practical uses. 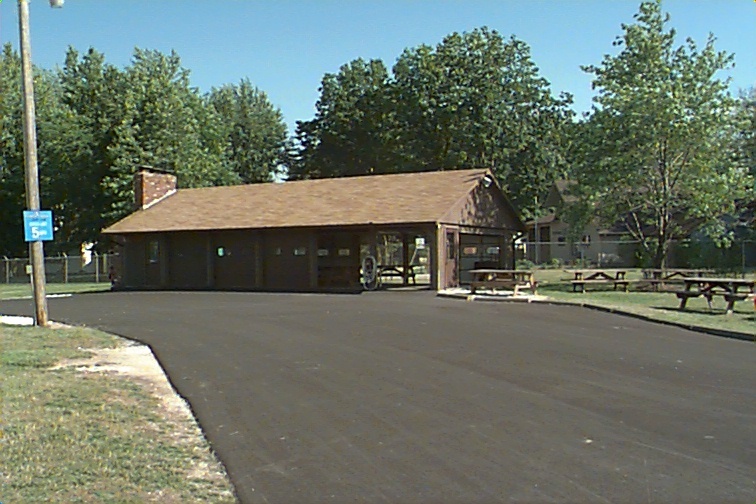 A continual area of social good will is the pavilion built in the early 1980's. This was enclosed by the Skipperettes in 1989 and a fireplace was added. For our enjoyment, members have generously donated gardens, benches and flowers in the memory of loved and honored past members. Dutz Thompson, Nadine Miller and Doris and Ellis Persing have graciously given their time to the upkeep of these. Social events remain an important part of our club, though their formats may have changed. Until 1957 the Commodore's Ball was held in our own clubhouse between January and May. Regatta dates varied over the years from July through August. The third Saturday of the winter months was dance night at the club, and this often meant square dances. A bowling league on "real" alleys was formed in 1960. The women had card parties often, and the men had their stag evenings. Hayrides, mystery tours and a night at the theater have all been enjoyed. Beach parties, spaghetti dinners, Halloween and New Year's Eve dances remain favorites along with our Welcome Aboard parties for new members. 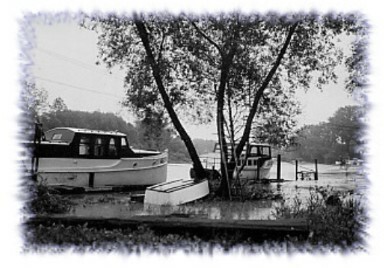 The Club embarked on boat trips to Rondeau Bay as long ago as 1957. Our club has gained affiliation with other boating associations. 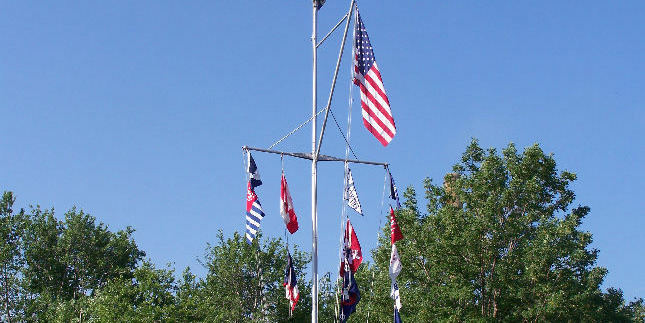 In 1956 our Coast Guard Auxiliary Flotilla 7-7 was established. We boast of Blue Gavel and Satin Gavel Chapters, as well as being members of ILYA, CRA and GCBA. In 1951 the officers and trustees of CLYC called upon the women of this club to help organize social functions and provide a means to get the news and information to the members in the form of a monthly or bi-montly bulletin. The officers wanted to see the clubhouse used more often in the winter months and to make the membership more aware of the possibilities. On September 24, 1951, thirty-two enthusiastic women responded to the call. Doris Halford was appointed Chairman until the Skipperettes were organized and an election could be held. Jean Brodie was appointed Chairman of the constitution committee, whose intent was to clarify the purpose, how and what of the organization. In December 1952 the first officers were elected: Skipper-Doris Halford; First Mate-Jean Brodie and Keeper of the Log- Bernice Phare. Meetings were held throughout the year at various homes. By 1953 membership had increased, and meetings were moved to the clubhouse. Skipperettes early fund raising included pot luck dinners, card parties, box socials, bake sales and white elephant sales. By April of 1952, a few short months after their official existence, the Skipperettes raised the noble sum of $1,000 to put toward completion of the clubhouse. The first Breeze was published for the membership in October 1951. Some of our pride comes from being a family oriented club where children are important to many facets. In 1955, a playground area was designated, and playground equipment has been donated over the years. In the 1960's there was a youth club organization called the Dolphins. The purpose of this group was to provide recreation, entertainment and friendship. The Dolphins also contributed usefully to the club by helping clean the beach and club grounds. Also in the 60's and 70's, a youth sailing club was formed to teach water safety, to sail as a fleet and to construct small sailing boats. More recently, regatta events and the bowling league are activities for our "Dolphins". After reviewing the past 50 years, we need to look to our future. Our boating membership has grown from 48 to 182. Our total membership numbers 200 with over 400 persons enjoying our facilities and camaraderie. The clubhouse was originally built as an intended basement for a larger structure, and as early as 1953, reference was made to a much needed second floor. It appears we are on our way to adding one of the more beautiful structures on the shores of Lake Erie. We will again be able to host our own Commodore's Ball - now in a lovely glassed dining room overlooking our lake. The women have also progressed. They have moved from meetings in their homes to publishing the Breeze and Roster, organizing social events for adults and children, raising funds for a multitude of beneficial club improvements and the first female officer of the club - Sharon Jacobs (1986, 1987, 1988 and who is also our first female trustee elected in 1991). Recent events included a motion and invitation for women to attend membership meetings. These are significant strides which, added to the other accomplishments of this organization, continue to make us the best yacht club on the Lake. All of this has been possible through the voluntary efforts of men and women over our first fifty years.